The Federal Law on Technical Regulation No. 184-FZ dd. introduces the definition “Technical Regulations” on December 27, 2002. The law separates the technical requirements from the legislation requirements and establishes the approach of obtaining certification to the standards by meeting the mandatory requirements for safety and health insurance for different kind of products from the technical regulations. Republic of Belarus, Republic of Kazakhstan, Kyrgyzstan, Armenia and Russian Federation commenced on June 2010 with the establishment of the unified technical regulation system. Government agencies of the three countries now delegate to the relevant authorities the adoption of the technical regulations of the Customs Union Commission. At the same time this Commission coordinates the three countries efforts to applying the technical regulation. The national norms/regulations prior to this adoption will be superseded by these new technical regulations of the Customs Union. The Technical Regulations state what products require mandatory certification and the type of certification. These could be either a declaration of conformity (DoC) or certification of conformity (CoC). Once the CoC or DoC is issued, they are valid throughout the territory of the Customs Union (Republic of Belarus, Republic of Kazakhstan, Kyrgyzstan, Armenia and Russian Federation). During the period of transition to the new EAC certification process all other certificates were valid until March 2015. After this date the product had to comply with the new EAC requirements. 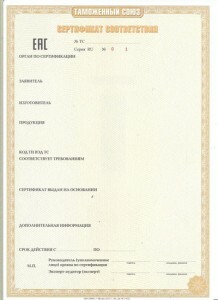 The EAC certification process requires the manufacturer to provide product documents such as the technical construction file, safety instructions, operators manuals and others, which will be checked by BAKIT to ensure compliance with the minimum requirements of the CU regulations and its referenced technical standards/ norms. 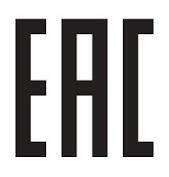 After successful certification the manufacturer is allowed to mark the product with the EAC mark. The TR CU certificate of conformity (CoC) or TR CU declaration of conformity (DoC) are an important part of the export document package and needs to be provided at the entrance boarder to the territory of the Customs Union. The certification of conformance will be completed in form of declaration and certification. In both cases the manufacturer will be required to provide the product documents such as technical documentation, safety instructions, manuals and others, which will be proved on compliance to the minimum requirements to the regulation and its norms. After successful certification the manufacturer is allowed to mark the product with the EAC mark. The company registered in the Customs union (manufacturer itself or its authorized representative) can only apply for EAC certification: The simple power of attorney is not enough for an entity to become the authorized representative. The manufacturer shall have a contract with the authorized representative who will be responsible for the product quality and assurance of the warranty for the local customers. BAKIT can provide the templates of the contract on request. Please note: for one off single delivery, the role of the applicant can be agreed with the local customer. EAC certification of a serial production product requires not only a conformity test of the product but also an annual factory inspection for the entire duration of the validity of the EAC certificate. The purpose of which is to ensure the factory has and practices adequate quality control. During the manufacturing process. For DoC this responsibility can be owned by either the manufacturer or authorized representative. BAKIT has the knowledge and expertise to quickly help you identify the best solution that fits your requirements and can also assist you with finding a local dealer willing to be the authorized representative. Delivery time: 3-5 days after a complete package of documents is provided and, if required, the factory inspection is completed. Validity period: For one-time-delivery or maximum 5 years.